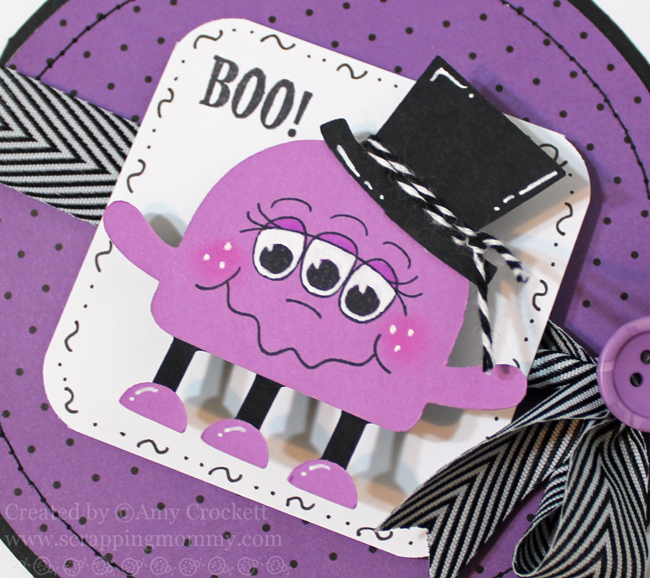 Hello and welcome to the super fun Halloween/Fall Blog Hop with Peachy Keen Stamps. If you have arrived from Janice Wilson's blog, you are in the right place. If you just happened upon my blog and would like to start at the beginning, hop on back to the Peachy Keen Stamps Blog to get all the details and to get started on the hop......there are some FABULOUS prizes up for grabs, so keep reading or check out the details at the beginning. Today the current and past DT are sharing projects for the upcoming season featuring stamps from Peachy Keen Stamps. 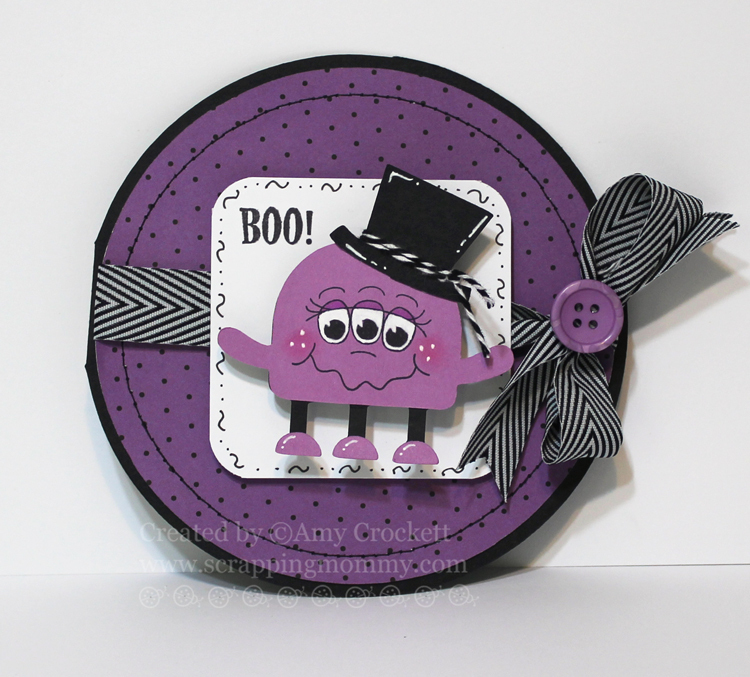 I created this darling round card with the little monster cut from the new Create A Critter 2 cartridge and the 1 1/8 Monster Mash Faces from Peachy Keen Stamps. To the little monster, I added some white pen details and tied some Charcoal bakers twine from The Twinery around the hat. I used my Cricut and Gypsy to weld the two circles together for the round card as well as to cut the round patterned paper piece. I stitched around the card with my sewing machine and tied on some of this fabulous May Arts ribbon and a button. The sale only lasts 24 hours so, hurry up and get your orders in!! Now on to our blog hop. Be sure to leave comments on all the blogs along the way because there are some AWESOME prizes up for grabs that include 1 $50 gift certificate and 4 $25 gift certificates to Peachy Keen Stamps.....WooHoo!! As an added bonus, I have a set of 12 Action Wobbles that I would like to give away to someone who leaves a comment on my blog during the blog hop. Be sure to leave your contact information so that I can get a hold of you if you win. Your next stop on the hop is the super talented Cristina Garcia. 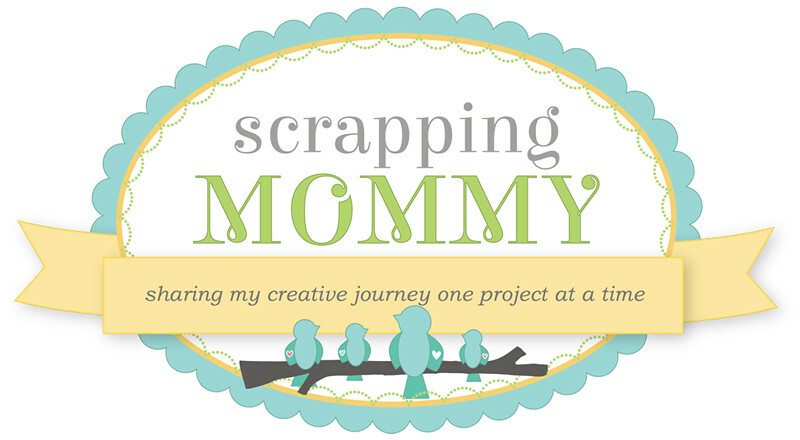 Hop on over to her blog to see what awesome project she has to share with you. Have fun!! What an adorable card! Love the monster on the wobble!! Just too cute, Amy! Love that face! Amy ~ Oh this is ADORABLE! LOVE that little critter and that face fits him PERFECTLY! Well your doodling is AMAZING along with the ribbon and twine ~ GREAT touches!!! Too CUTE!!! The little 3 eyed purple monster is really adorable. He just sets the card off. Thanks for sharing. Amy this is a great combination (the square with this shape card). Love the purple too. I like the color too. Thanks for share! love everything about your card Amy! the is face is perfect and the wobble is the icing on the cake!!! Absolutely love the card. the purple is perfect and I just love the ribbon. TFS. Love your wobble monster :) I've always wanted to try wobbles, but never have. Thanks for sharing. awwwwwww, im in love with everything on this card, the wiggly monster,purple, polka dots, and the ribbon!!! too sute great job!!! Love the purple monster! and a wobble too! Super cute shape card! Love that ribbon! Fun card. Love the wobble and purple! This is adorable!! The shape the all purple and of course the wobble!!! This is cute!!! I love that it is purple and round! the 3 eyed monster is so friendly looking! not scary at all! SUPER cute card! Very nice job. So sweet,i think it is super adorable. What a fun card. Who doesn't love action wobbles? It's perfect for your card. The pen work really makes the little monster guy come alive. Super job. I LOOOVE this card! That purple is AWESOME and I love the cute monster! The stitching lines are great and I love that he's on an action wobble! TOO CUTE! Amy your card is so cute and i love that you used the wobble on it. Great job !!! Awww! He (or she) is sooooo cute. boy, that card grabs your attention! Fabulous in purple--I like the twine and ribbon you used too. Thanks for the chance at action wobbles. What a cute, round card!! Love that wobbling monster! Thanks for sharing! OMG! That is just 2 cute! love that it wobbles too! That has to be the cutest little monster around! 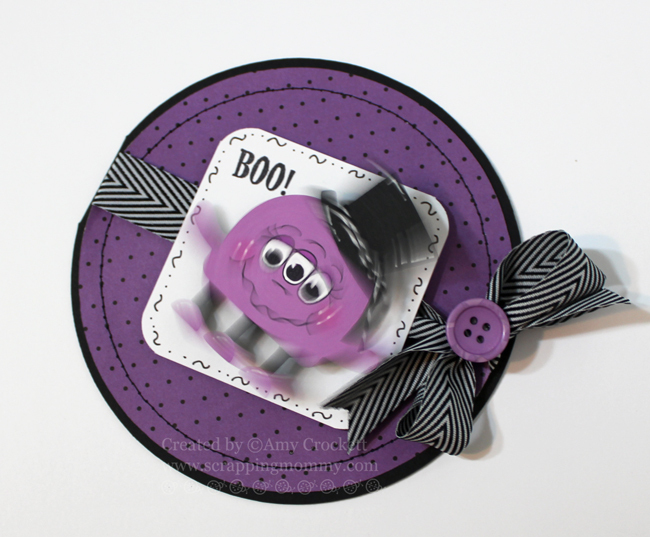 Love the round card and the great purple and black combo...super fun card! Super Duper Cute Card!Awesoem Job!! I just love purple at Halloween! This is a great card! Thanks for sharing. What a cute wobbley monster!! This card is too cute!! I LOVE the colors and the ribbon!! Love the shape and color of your card. But the Wobble makes it great!!! Love this card! I love the purple and that little creature is adorable! Super clever! Love the addition of the wobble element and the bright vibrant color! Really cute card! I love the ribbon on it! The little monster on the wobble is adorable! Have to love the wobbles. I love how it is Halloween but in PURPLE. very nice. Love your card, the monster is adorable and love that you put him on a wobble. such a cute little wobbly monster! I love your card! Thanks for sharing it and inspiring us! Beuatiful card you did, thanks for sharing. Fabulous card!! LOVE the wobbly monster!!! What an adorable little monster! SO CUTE! CUUUTE CARD YOU DID!!! THANKS FOR SHARING! Beautiful job on the card! I love the purple and of course the action wobble! Very fun! I love that little monster and the purple color choice is just perfect!! Very cute card!! Love the purple, (my fav. color)!! Cute card! Love the purple monster! so cute - I really like the colors! how super cute! I love the use of purple, black and white. It's so sharp looking! Love the twine on the hat! So very cute! What an adorable card. Love the purple and black colors. So cute!!! love the black and purple color Amy and the twine detail. Thanks for sharing and for the chance to win some AWs. Love the card. Love the use of action wobbles! Halloween cards seem perfect for action wobbles, don't they! 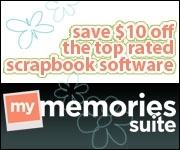 UGGGG... my computer went wacky and closed out the mext blog!!! So sorry this comment is for the next blog... disreguard this.... sorry...lol! such a super cute card! tfs and the chance to win.. im a follower of your blog. Oh this is beyond cute...love that little monster! Thanks so much for playing with us at CAS-ual Fridays! That is such a cute card!!! My niece and nephews would love it! 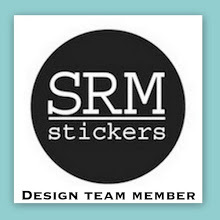 I'm a new follower to your blog, but love everything you create!! Super cute!! He makes me smile!! cute card. great use of action wobble. tfs. How cute is this little monster with his top hat! Halloween is a great time to play with wobbles! Really makes monsters scarier!! Love the purple and black! The hat on the monster is too cute! Such talent. My favorite color is purple. First time visitor to your site. Will visit again. Love the new create a critter 2 cartridge and I just adore your cute little wobbling monster !! Love that you made a round card, you don't see many of those !! An adorable purple people eater! This purple monster is just toooo cute! TFS! Great card. Great color combo. The monster is super cute. TFS. I just love this! Bootiful! cute little monster, and with a wobble, so cute! Love this! I love purple and black together for Halloween colors and your little monster is the cutest! Incredible card. like the twine, stitching & purple color! Super cute card!!! :) I love the colors! Love your little three-legged guy! What a fabulous card! Love that new cartridge! Thanks for joining the fun this week at CAS-ual Fridays! Too cute. Love the wobble. Thanks for sharing. This is so cute my friend!!! I love the little top hat! And especially love that you used a wobble!!! CUTE!!! Wow i didnt know there was a create a ctitters 2.thanx for the info. and i love your wobble monster card. This is so adorable Amy!! Love that monster!